Put simply, UHC is the idea that every person, no matter where they live, should have access to quality health services without risking financial hardship. But accessing quality health services is only half of the equation. Every person should also have available to them medicines that are affordable, safe, effective, and of assured quality. An estimated one-third of the world’s population does not have access to the medicines and health products that they need. Even when medicines are available, many patients in low-income or marginalized groups find they are unable to afford treatment regimens, forcing many to make the impossible choice of abandoning treatment or falling into poverty for obtaining the care they need. In India alone, increases in total out-of-pocket spending on health, including medicines, forced an estimated 39 million people into poverty. It is imperative that as we increase our focus on making UHC a reality, we must also ensure widespread, equitable access to medicines, diagnostics, and health supplies. 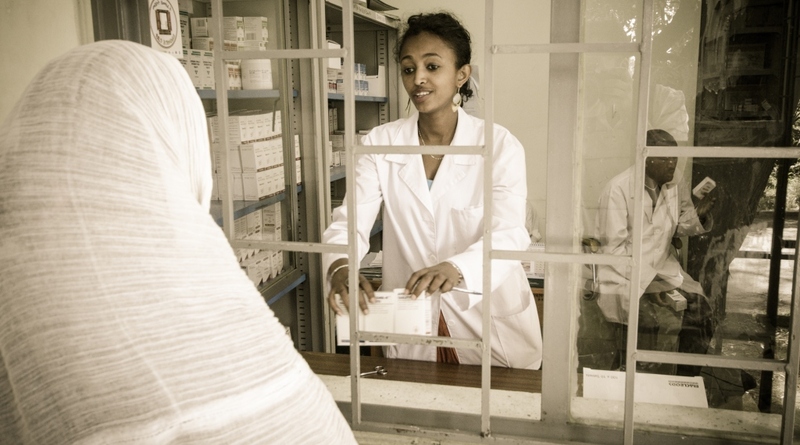 While strong supply chains are essential to expanding access to medicines, investments to strengthen pharmaceutical systems as a whole are also needed to ensure that access is equitable, sustainable, and country-led. Infusing support throughout all levels of the health system – from the development of national-level legislation and guidelines to the provision of high-quality, patient-centered pharmaceutical care – ensures that the interrelated and interdependent factors that affect access to medicines are addressed in an integrated and coordinated way. With this view toward systems strengthening, the USAID-funded SIAPS program is identifying ways in which expanding access to medicines may be integrated into the context of larger UHC efforts. Often, the medicines-related components of UHC are referred to as medicine benefit programs. Toward this effort, SIAPS, along with other partners, convened two major meetings for global stakeholders to discuss and consider programmatic challenges in designing and implementing medicine benefit programs. These discussions have highlighted experiences from countries at many different stages of UHC roll out and, importantly, have spurred the ongoing development of guidance documents and key considerations to inform efforts to expand access to medicines through medicine benefit programs. For example, despite decreasing levels of external development assistance, the government of Namibia is exploring ways of implementing UHC programs nationwide to extend coverage to the 85% of the population not currently covered by existing health plans. Through an in-depth assessment, SIAPS helped to review Namibia’s current medicine benefit programs and health insurance schemes and identified several ways to expand health services to additional populations by diversifying funding mechanisms, creating greater systems efficiencies, and incentivizing the rational use of medicines. By working together with countries to evaluate potential options, assess program gaps, and identify system weaknesses, SIAPS is working to support countries in developing innovative strategies that can help integrate the medicine benefit component into UHC programs while promoting the principles of inclusion and equity. Although advancing UHC may be among one of our greatest global health challenges, successes are already being achieved in many low- and middle-income countries. This progress, along with the growing momentum for UHC, provides an unprecedented opportunity to strengthen health systems and expand access to medicines for marginalized populations globally. And, by considering access to medicines as part of the UHC equation now, we can ensure that in the future, patients will have access to not only the health services they need but also to the life-saving medicines that can protect, improve, and restore their health. Because health is a human right for every person, everywhere. Correction, December 29, 2014: This post was updated to reflect the following: In India, increases in total health out-of-pocket expenditures–not only out-of-pocket spending on medicines–pushed about 39 million people into poverty. For further explanation on this data, read this article from The Lancet.